In Guided Math, students engage fully with math to produce long term mastery of concepts and the application skills to understand these math concepts in a variety of methods. Students learn to think mathematically. 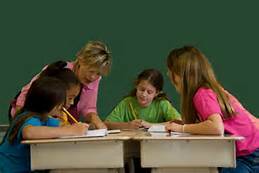 Guided Math combines many teaching styles: large group teaching, small leveled group instruction, and individual practice. Mastery of Math Common Core Standards is achieved through many research based techniques. Students learn to apply math skills through hands-on centers or cooperative learning exploration. Math concepts and skills are constantly and consistently reviewed based on brain-based research learning precepts. Ongoing, multiple levels of assessment occur weekly to provide student data to drive your math instruction for the next week. Guided Math meets individual math needs of students. Guided Math provides teachers with a structured framework for every math lesson. This program allows teachers to integrate any math curricular program into this model. Response to Intervention components are built into this model because it incorporates leveled math groups, direct instruction, data driven teaching, and consistent review. Large Group Instruction details how to incorporate short mini-lessons based on standards and any math curricular book. Also I will talk about incorporating specific vocabulary instruction and whole group student practice of state Standards with manipulatives. Guided Groups detail research-based techniques for planning for your small group instruction time. I give you my planning and recording sheets along with my rotation schedules for each group. We spend time learning how to group your students according to pretests, how to plan for each guided group’s needs, how to plan weekly guided groups lessons that incorporate algebra (do these lessons with all four groups), and how to incorporate hands-on lessons every week into each group so students understand math better. Engaged Math Activities incorporate activities that promote student’s application skills. These activities take the basic learning of concepts to the next level of complete understanding. Students love this guided math station because they get to play math games. (or as the research calls it… manipulate math) Teachers love to see the growth data from this station. I show teachers how to purposely plan these activities and when to incorporate them into your curricular mapping. Teachers even receive some free activities based on their grade level! Math Facts is the fourth rotation station. Here the students practice their basic math facts daily. Learn how to purposely plan for this station, how to differentiate, and how to incorporate technology. In addition to the above stations, Guided Math teaches how to Build Math Thinking. This aspect describes how to systematically teach Bloom’s higher level thinking skills within your lessons. I demonstrate 8 ways to improve your students deep understanding and reasoning abilities. I show you how to use assessments to group your guided math groups. I use assessments that focus on 1 to 2 concepts only so your instruction is like a laser beam, focused and powerful. Visit Angela Bauer’s profile on Pinterest.